Uneven surfaces, rough asphalt, cobblestones… The stresses coming from the road are transmitted directly to the handlebar in the form of unpleasant vibrations, which in short time can turn into annoying tingling to the hands, compromising comfort and grip on the handlebar, with inevitable negative repercussions also on performance and safety. To be able to absorb and reduce them to the minimum, you need a handlebar with “muscles”: a simple but brilliant idea introduced by the Shock-Absorber Kit by Selle Italia. Shock-Absorber Kit consists of two elements: Bar Pads and SG-Tape. SG-Tape is a special tape with grip that allows you to ensure even greater comfort and better grip on the handlebar, bringing advantages in both performance and safety on the saddle. The Bar Pads are made up of three layers of different materials: the first, in gel, helps to simulate the behavior of a muscle, compressing at the support and recovering in a few seconds the original shape, as soon as the pressure of the hand is removed. Besides the gel layer, the addition of PU Foam and a third Lycra layer help to increase the softness of the Bar Pads. 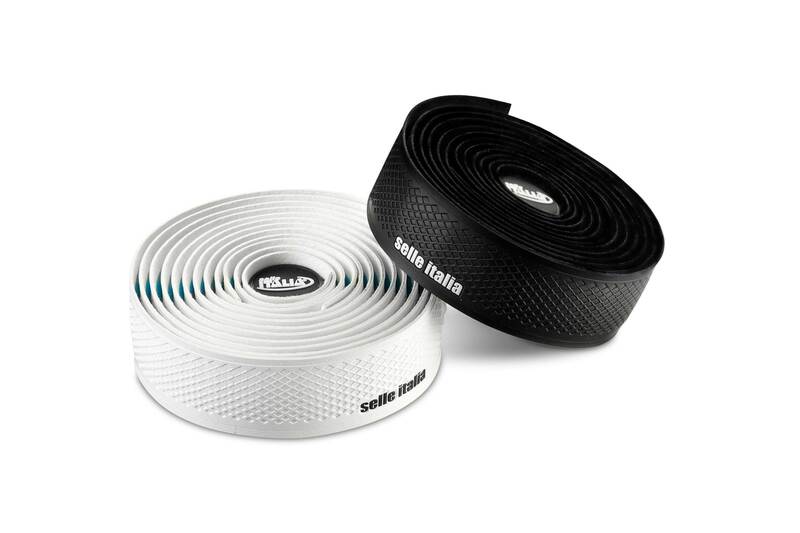 The Shock-Absorber Kit by Selle Italia, thanks to the combination of the bar pads with the special tape with grip, ensures a high level of comfort at all times, while also offering a better grip on the handlebar, all to the benefit of performance and safety. Thanks to the particular assembly of these two components, the Shock-Absorber Kit, in addition to being one of the lightest on the market, also performs a combined action that produces a very effective absorption of vibrations from the ground, the ultimate solution to the discomfort caused to hands and wrists by driving in difficult conditions, so far difficult to solve. Do you already know your ideal saddle size? Take a scientific mesasurements at the closest idmatch dealer.